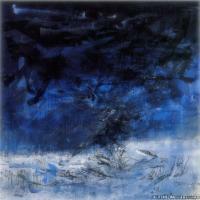 Zhao Wuji (French name Zao Wou-Ki), French born Chinese painter, a native of Jiangsu Zhenjiang Dagang Town, Zhao Kuangyin is the thirtieth generation. 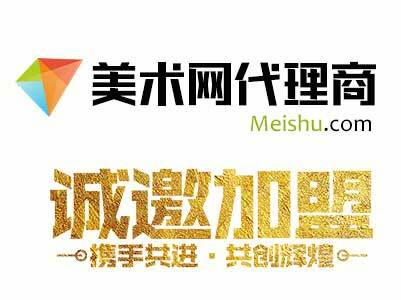 French Chinese and Chinese American painter Zhao Wuji, Mr. Ieoh Ming Pei, a Chinese American composer Zhou Wenzhong, known as the "overseas Chinese art treasures". 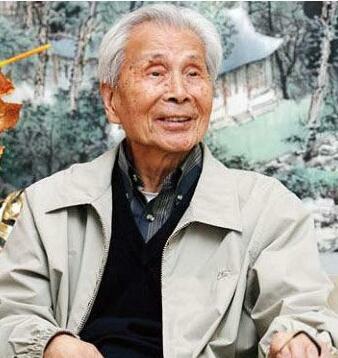 Born in February 13, 1921 in Peking (now Beijing). Childhood study in Jiangsu, Nantong, and learn painting. 1935 Hangzhou art college. 1948 went to France to study and settle in france. Young Zhao Wuji is especially favored the Northern Song painter Mi Fu, think he is one of the greatest painters in this respect to the old Chinese, bujiandangnian - "he is another view of the painter, a great calligrapher." He will not western modern painting and the color of the oil painting techniques, combined with the China traditional culture connotation, in the painting, the modern western painting form and the color of the oil painting skills, participate in China traditional arts and culture connotation, creating a new painting space of color changes, strong strokes, a rhythmic and light representative, known as the "western modern Lyric abstract". 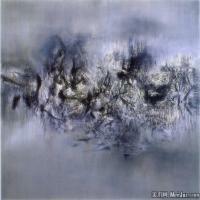 He is currently a lifelong painter of the French gallery and a professor of Paris National Academy of decorative arts. Has held more than 160 individual exhibitions around the world. At the age of 14, Zhao Wuji entered the Hangzhou College of art education, facing the realism of mechanization, Zhao Wuji was trying to capture the composition of the draw further apart, "reason" and "force", abandon the plot, to the theme of unity. 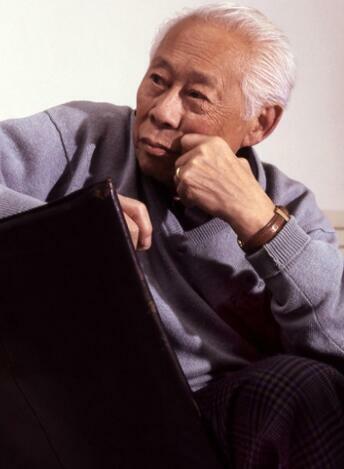 He taught Zhao Wuji in 1941, held the first solo exhibition in Chongqing. 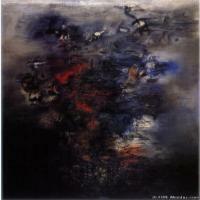 1947 held in Shanghai solo exhibition, moved to France in 1948. 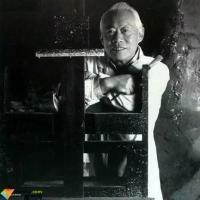 In May 1949, Zhao Wuji held his first exhibition gallery creuse in Paris. 1953-1954 he was in France and other countries (Geneva, Rome, Bern, Milan, New York, Nimo mu...... Hold exhibition many times. 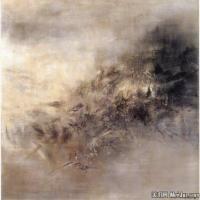 Zhao Wuji (), brigade painter. Zhao Wuji was born in 1921 in a literary family in peking. The family is the source of a long, straight up the Northern Song Dynasty Royal genealogy Yan family. Zhao Wuji was as talented, interested in literature, Chinese and foreign history. His family, especially his father and uncle, attaches great importance to the art of painting. His father often from aesthetics and techniques not to mind taking the trouble to explain the views of children painting inferior, his uncle often back from Paris some fake paintings postcards for Zhao Wuji. In a family of intellectuals, everyone is interested in painting art and curiosity, he is in this environment inspired painter's ambition. 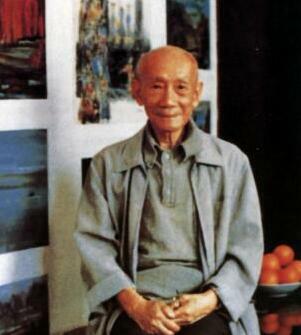 In 1935 at the age of 14, he enrolled in Hangzhou Academy of fine arts, six years, by drawing plaster, sketch models to painting, which also learn Chinese painting and Western painting copying, theory of art courses. His early works mainly by Cezanne, Matisse, Picasso as a teacher, close to the Western Impressionist style. That is what people call the "representational" period. In 1941, Zhao Wuji held his first solo exhibition, but he was not satisfied with the traditional Chinese painting. He expects a more satisfying training. He went to Paris in 1948 with his first wife, Xie Jinglan. Days in Paris, he met many artists, such as Bram, Raj, Hartung et al., familiar with then Paris Sal Nucci art curator Eli Saif, and the poet is Michaux and he and his third wife, Vasva also met in Paris. Painting in Paris to fully carry out, in May 1949 in the art gallery held the first solo exhibition. While he was painting, Western painting has made a thought, to achieve a breakthrough to the mark, so he made the painting inspiration was catapulted into the abstract world. He continued to explore the possibility of painting, but in the Chinese ink rendering methods and space concepts have been recognized, his painting to another stage. Later, his paintings were distributed in color and space, leading the viewer into an invisible and tangible infinite world. 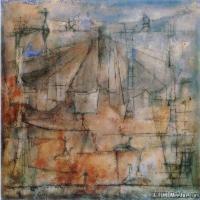 Zhao Wuji from Cezanne, Picasso to Klee, when art from architecture a complete world transition to random creation stage. At this point, the audience has been unable to directly from the visual image to define the content of the work, written in 1952, "still life" is a model of such transformation works. The picture at placing branches and debris, and other strange and mysterious atmosphere full of desolation. For the artist, still life is the color and symbol, in a certain light, with a variety of warm and cold colors, he got rid of the figurative style, from the decomposition of subjective appearance, the objective form appeared in simple forms. After the 1958 works "cloud", Zhao Wuji's works no longer have titles, he only marked the creation date on the back of the canvas. He works in 60s and 70s, and gradually get rid of all the rules, they lose his freedom, to a variety of innovative combination way to express the inner feelings and needs. Zhao Wuji after his 80s work, with the growth of age and experience, injected more warmth and soul. Passion and opposition are gradually dissolved into clouds or water vapor, in 1986, an important work "tribute to Matias", people can find his change, he focused on the screen harmonic, more smooth color. If the writing symbol is the milestone of their creation, the use of color expands the artist's painting language. Until today, the more than and 90 year old Zhao Wuji still diligently work, he said: "I am not afraid of the old, is not afraid of death, as long as I can take brush, paint, I have nothing to fear, I just want to have enough time to finish the painting on the hand, more freedom than larger bile, a.
Zhao Wuji was born 1921 in Peking, grew up in Nantong and studied painting in Hangzhou, art in Chongqing and Shanghai; in 1948 1964 settled in Paris, naturalized french. The creation of figurative paintings based on characters and landscapes. 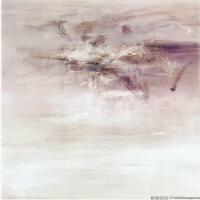 Since 1954, his painting into abstract, floating in the void space and changing colors. 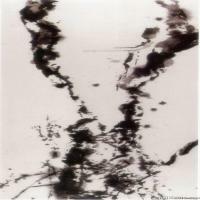 Later, the symbol gradually dissolved, disappeared, the picture for free strokes and large color instead. After 50s its creation can be divided into two stages. The first phase was in 60s and early in the early 70s. 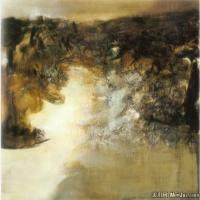 Works with black, brown, dark tone, fierce strokes, full of strength, a sense of motion picture, after the middle of the 70s, Zhao Wuji painting into another stage, the painting skills are more skilled, the color becomes bright and beautiful picture to focus more on the pursuit of space and light, contains various elements of nature and the world. The scenery has more meaning, the atmosphere more calm. After 1959, his works further emerge from the image, description and plot, more forthright expression of spirit and emotion. He likes big canvas painting shop on the ground, enjoy the unrestrained. Zhao Wuji was deeply influenced by the China culture, works are always filled with oriental flavor, exquisite flavor. 80s after Zhao Wuji's artist international reputation, art status to climb the peak of the era. During the creation of heart freely, regardless of color and pen are sharp, firm and confident. Over the same period as the "the Peach Garden" wonderful giant 25.06.86, the suspension of the purple grape and deep blue layers of white, gray and white smoke tone to create a waterfall like scenes of turbulence. Confused, gray and brown ore through the comparative performance of cobalt, and continuously to the mutual penetration and expansion, during a flow of style; the artist pen. When light weight, the viewer into an endless space to imagine flying. Three straight stream is very special, with Chinese vertical composition ink painting as a blueprint, meaningful. The works preserved in European private collections, in 2012 Sotheby's spring auction will expose the valuation of 18 million to HK $28 million. In 90s, Zhao Wuji's painting is consummate, on the one hand, more images, such as "90 years" in October 25th with the moonlight like water, "February 6th 96" is gangluan tree shape; on the other hand, but also into the image, further reflect the unique China philosophy of heaven the spirit of ecstasy, empty and quiet state. December 2002, Zhao Wuji was elected College France Academy of life. Zhao Wuji won the French legion of Honor Medal, the national group third group third medal, the medal of art and literature group, Paris City, the Japanese Empire Medal of Arts Award etc..
No sir, very early for Italy Holland and France and other classical painting style, by Picasso, Matisse and other Western modernist art master Klee, in order to "do not copy the natural and natural reproduction" in the creation, he experienced many painful process of self denial, "compliance observe moments is not creation". He had expressed in the creation of memories of life, in the face of the day before the painting works, he refused to comply the will of color and space and get great pleasure in the brush, painting and the "struggle" day in and day out, although have discouraged and tired. Zhao Wuji is worthy of a painstaking creation of art. Apart from painting, he sees very light about other things. When asked something specific, he always said that it would need to ask Mrs. Francois. 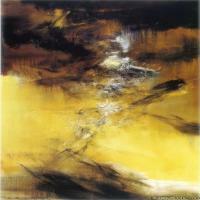 Mr. Zhao believes that artists should use painting to speak, it has been insisting that the less artists say the better". Good works of art must be telepathic communication with the audience, a comment on the people of the world. The laughing introduced, he devoted his life to painting the hearts of the painting, and have fun in the continuous creation. Every day he still adhere to the four or five hours of creation, but in order to maintain physical strength and be able to climb up and down on the easel, he insisted on playing golf in a week under the guidance of the coach. According to the 60's wife Francois, Mr. Zhao every year in Fontainebleau often villa Huibi painting, more studio store a lot of finished frame, including one specifically for the lady and passion creation entitled "red" works. Mr. Zhao Wuji from 50s in Paris painting brand head exposed corner, has been kept in the international art world famous record, he enjoyed the international art world for many of his honor and respect, but also Chinese art glory. Mr. Zhao Wuji in the early days of Hangzhou national art college to study, by Lin Fengmian. What he learned from Lin Fengmian is not the specific painting skills, but the spirit of innovation and the pursuit of artistic freedom realm of Lin Fengmian. From his early works can be seen, he is a gifted quality painter, with no shelter to express their feeling in the works, is not confined to academic realistic skills, but also with the freedom to express his dream. Also because of the dream of art, he went to Paris. Later proved that his temperament and French culture almost natural affinity, in the land to smooth development. His art is never overbearing edge, the revival in postwar European painting exploration boom is very consistent; his art is full of wisdom and profound, which enabled him to constantly promote and improve their own style in decades, each stage has a new realm; his art full of sensibility, and the French the whole art in the kind of warm and elegant taste with congenial. The French received his first art in the feeling, and the whole western painting from the logic of art history in recognition of his art. 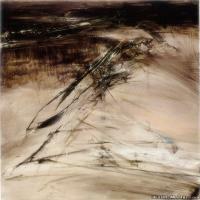 Mr. Zhao Wuji is in overseas to meet the tide of Western abstract painting, he started from the performance of figurative painting, into symbolic imagery painting, and then developed into abstract painting, in the process of establishing the style, his artistic realm also increasingly expand. Western abstract painting is done on canvas form construction, Mr. Zhao Wuji from the vision and feelings about the nature of the rise as the abstract language, which opened with the Western abstract painting distance. His stage works is a completely abstract form of the world, but the stack of print in a full of life rhythm of the natural world, let life many projected illusion from the aesthetic imagination, see the vast natural changes. This is an abstract form painting based on Eastern tradition, which is the blending of Chinese and Western art in spirit. 9 pm local time, Zhao Wuji, the Chinese American architect Ieoh Ming Pei, and Chinese American composer Zhou Wenzhong is French Chinese famous painter known as the "overseas Chinese art treasures, an illness died in Switzerland at the age of 93. The lawyer said, suffering from Alzheimer's disease Zhao Wuji, from the end of March 2013 has been hospitalized twice. Zhao Wuji's son Zhao Jialing later confirmed the news, said his father was seriously ill during the family has been accompanied in the side, thanks from all walks of life care. Work repeated auction record lift Zhao Wuji hot"
Zhao Wuji is currently the world's highest value Chinese artists. The end of April 6, 2010 Sotheby's Hongkong twentieth Century Chinese art auction "concert, Zhao Wuji painting" 10.03.83 "to 32 million Hong Kong dollar hammer, this" high price "for the works of Zhao Wuji is a" normal ". Is it hard to make a living by drawing in Paris?" In 1920, Zhao Wuji was born in Beijing, at the age of 15, he entered the Hangzhou art college. The return of the school by the French head Lin Fengmian, Zhao Wuji's teacher is Wu Dayu and Pan Tianshou. In 1964, settled in Paris 16 years later, Zhao Wuji became a French citizen, not only to break the teacher Lin Fengmian "in Paris is almost impossible to make a living by painting", European painting still occupies a space for one person. In the painting is my life, he wrote: if a person must do something crazy in his life, then painting is my whole life, but also my life to pursue the only virtue...... Although I joined the French nationality, but one of the things I have or Chinese. "He said," the source of my painting is from china. " Zhao Wuji and Picasso, Zhang Daqian and other famous friends are. In France, the surprise is that he is in the south of France was once adjacent to Picasso's studio studio. Has eight days of Picasso indulge in painting, even their children are not seen, but he is very kind to Zhao Wuji. Every time he met at the gallery, he greeted him warmly, "short Chinese!" if Zhao Wuji is not there, he will ask, "is that short Chinese coming?" Zhou Chunya in foreign countries for the first time in micro-blog expressed his regret for the death of the master. "One of the most influential Chinese artists in the world, an artist who contributed to the development of world art history, a respected artist. "Zhou Chunya told reporters yesterday that he had seen in the exhibition of Zhao Wuji, but because of the long living abroad, and domestic artists scanty, but also through their own biographies to the life of Zhao Wuji. In Zhou Chunya's impression, Zhao Wuji is a very honest man, with a simple spirit of older artists, treat others tolerant. 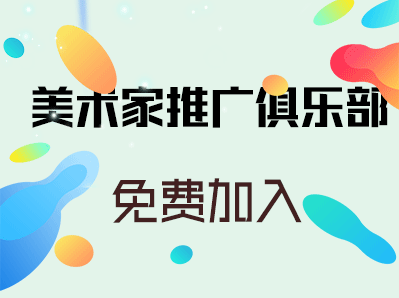 Most importantly, Zhao Wuji's artistic creation influence on early artists is very large, is the largest Chinese artists "in his abstract painting with China traditional culture thought and style, with limitless in art history status and influence. " Critics Lu Peng also expressed nostalgia. 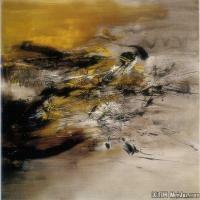 Its evaluation: "his works have distinct Chinese traditional style and temperament. He will freehand painting into the works, making its abstract painting has a distinct personal characteristics. His works have been paid attention to by the world art circles, and in the western art history. " Chen Mo: achievements not less than Qi Xu zhang"
Critic Chen Mo said: "after the death of Zhao Wuji, there will be no other Chinese painter who has such a great influence on Western art in the short term. Chen said, Zhao Wuji's achievements are definitely not less than Qi Baishi and Xu Beihong, Zhang Daqian contributed to the exchange of eastern and Western art, but its contribution is far less than the contribution of Mr. Zhao Wuji. "